Inspire the children in your Sunday school class to think about complex concepts such as faith. Each bulletin is packed with word games, seek-and-finds and other puzzles designed to make learning about faith fun! All of the games and puzzles in Children's Worship Bulletins are rooted in Scripture. By using proven educational methods, we've designed our bulletins to teach basic Scripture knowledge, not doctrine. Our bulletins have been endorsed by pastors of all denominations, making them perfect for all churches. It's easy to expand any of the puzzles and games from our bulletins to create Sunday school activities suitable for ages 3-12. In this short article, we've provided two examples of Sunday school activities about faith to share with your class. Try one this week! Give each child a bulletin, some crayons and a pair of scissors. Read aloud Hebrews 11:1-3, 8-16 while the children are working. When the children have colored and cutout their universe pieces, give each child a prepared craft stick. Have a volunteer read aloud the verse on the craft stick. Help the children tape each of their pieces to one of the yarns attached to the craft stick, making a universe mobile. Explain to the children that they can hang up their universe mobiles to help them remember that it is by faith that we know God made the universe. Give each child a bulletin and a pencil. Instruct them to complete the "Faith is believing without seeing" puzzle. When the children have finished their puzzles, explain the activity, "Today, we're going to talk about what it means to have faith. Our Bible verse, Hebrews 11:1, tells us that 'Faith is being sure of what we hope for and certain of what we do not see.' How can you be certain of what you can't see? (See if someone has an answer.) Let me give you an example. I am certain that there is a meteorological phenomenon that we call wind. Can you see wind? No? So how can you be certain that there is wind? (Allow children to explain how they are certain that there is wind. Write reasons on the board.) The reasons that you've given, that you can feel wind, that you can see the trees bend in the wind or that you can see the ripples on a pond when wind blows across it (substitute the reasons your class provided) are evidence that wind exists — even though you can't see wind. Summarize today's activity, "'Faith is being sure of what we hope for and certain of what we do not see.' We have faith that the wind blows based on the evidence of what we see and feel when the wind blows. We have faith that our parents love us based on the evidence of our experiences. And we've listed all this evidence (pointing to the board) that God created the universe, even though we weren't there when He did so and didn't see Him do it. So, can we reasonably agree that 'By faith we understand that the universe was formed at God's command, so that what is seen was not made out of what was visible?' Yes, we can have faith in God, even though we can't see Him." 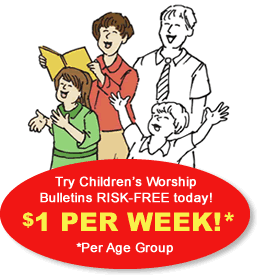 The Children's Worship Bulletins library is extensive. There are thousands of bulletins available about Scripture from both the Old and New Testaments. And our library is constantly growing! You can search for exactly what you need, whether by Scripture verse, lectionary or topic.